Some folks sure make a big fuss over aliens. I’m not talking about the illegal kind that are hopping fences or digging tunnels under the border. I’m referring to the ones in flying saucers, the ones with the big heads who look for those crop circles that “mysteriously” appear in fields, some kind of signal that says “Land your spaceship here”. Sorry I’m not buying it. It’s utter nonsense. On the other hand, I reckon if there were such creatures out there, they might find some similar markings in our hillside. Now these markings would not be from any crop circle up here on our hillside. We couldn’t get a healthy stand of crops or grass to grow on this hillside if our life depended on it, unless we would happen to chop all of our trees down. We love our hundreds of trees and the shade they provide us, so we haven’t sacrificed them for the sake of any grass yet. The leaves are the problem. These hundreds of trees produce piles and piles of leaves, thousands of them. Those dandy green hanger-ons waving on every tree in the spring and summer around here eventually crumple up and turn brown, turning our forest floor into a crunchy carpet. Because we have so very many leaves, I usually start raking them in the fall, work through the winter, and about the time Easter rolls around each year I somehow get them to a manageable level. The method is simple—burn them. I’m still waiting for one of those geniuses to come up with an effective way to use all of these leaves for fuel to keep me warm in the winter and to keep the lights on. Since I’ve not seen anyone come up with that yet, I reckon we’ll just keep ridding ourselves of them the old fashioned way by burning them. The burning is what causes the temporary scars all around our hillside. I have several locations that are somewhat cleared out in the trees that enables me to burn the leaves. While I still have to carry loads of leaves a short distance, I generally try to burn them as close as possible to the area from which I am raking them. 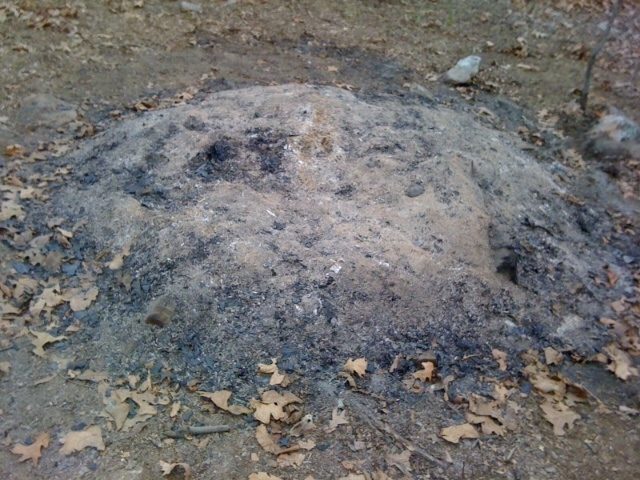 These multiple burn piles cause the markings on our hillside and keep me from having to cart the leaves all over creation. If the aliens come, they will see these large ashen circles from above spotting the landscape. With yesterday being a beautiful spring Saturday morning, I got out of bed before the crack of dawn and commenced to taking care of our overpopulation of leaves. I raked and hauled and hauled and raked using my typical method of filling an old plastic trashcan and hauling them to the burn pile. I had been at this for some time when the little people inside the house began coming out of the woodwork, excited that Daddy had a blazing fire going strong outside. I almost always get the parent of the day award for being the one who strikes a match under any ‘ole pile of leaves and sticks. I guess that’s comparable to the times that Mommy gets the award when she’s in the kitchen making cookies or a cake. After being at it for several hours and starting to feel cramps in my arms from raking, the kids were faithfully staying by my side, especially Olivia and Joshua. Joshua has a real love for wanting to constantly throw stuff into the fire, so I really have to watch out for him. Olivia does not seem so brave around the fire, which is really a good thing, but she wants to just stand around where I’m working and talk my ears off. After I had already been working at it for more than half the day I was nearing an area in which my leaf blower would really come in handy. I went to the garage and fetched it, and after a little bit of struggle I managed to get it fired up and roaring. I used it to blow off our driveway and the steps leading up to the backyard, which are quite a challenge to clean out without the leafblower. As I came to a stopping place on a portion of leaves that I was blowing, I shut off the leafblower when I saw Olivia approaching. She was as happy as she could be seeing that I had shut the loud beast off, knowing that she could get back to talking. She did. Katrina and the kids had made cookies one night, and the next day our oldest daughter Reagan was home spending the day with us. After lunch, in their usual fashion, the kids wanted dessert. Reagan had not been involved in the baking the night before, so she was unaware of the homemade cookies. Joshua, in his most sincere voice, looked at Reagan and asked, “Reagan, do you want some snooternoodles?” Reagan and I both looked at each other like he was crazy, and then finally figured it out. They had made snickerdoodles. Over the past several months, as Olivia has worked on her speaking skills, I’ve had to sometimes rely on the translator, Mommy, or even one of the other younger natives of our clan. Many times I have looked Olivia in the eye and asked her, “Do you speak English?” That usually gets a giggly response from others around. Someday, when the aliens identify our ash pits from the sky and land here, we may have to send Olivia or Joshua out to speak with them first. These aliens may encounter some variation in the English spoken around here and may be able to better relate to the kids than me. I can even picture the kids bringing them in to the kitchen and offering them something to drink from the fridgalator. Now that I think about it, I reckon my Southern drawl could also count as an additional language as well. Perhaps we are more bilingual than I thought. This entry was posted in Children, Outdoors and tagged Aliens, Appliances, Bilingual, Children, Conspiracy, Crop Circles, Fall, Fire, Leaves, Outdoors, Snickerdoodles, Spaceships, Spring Cleaning. Bookmark the permalink.